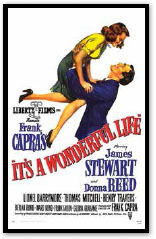 It’s a Wonderful Life (1946) is a classic Christmas movie about the impact that one individual person can have on the rest of the world. George Bailey is a man who is down on his luck and feels bitter towards the world. But with the help of an angel-in-training, George gets a glimpse of what the world would be like if he had never been born.